I woke yesterday morning to find my black ghost injured or sick. One side of his face seems swollen and is very red. The gill on that side looks inflamed. I have rocks that I have piled into large caves. I assume he got stuck in the caves. It looks a little better today and he is active as always and comes to water surface as soon as I drop fish food in the tank. He is still eating like he always has. ammonia 0, nitrite 0, nitrate 0.The tank is 225 gallon and There are two Bala sharks, two blood parrots, one ghost knife, two angels and four Bolivian rams and a huge Pleco. Sorry, its early, haven't had my coffee! The picture is attached here. �� Only gets less blurry *after* I've had my coffee! Thank you for the advice on the BGK! I have PraziPro here at the house so I'll get that in the tank today! Have a great day! Hello Neale! This is an update with a question I couldn't find on the site. The BGK seems to be doing well. I put the PraziPro in the tank last Wednesday and today I think I may see a little bit of rounding near her pectoral fins. 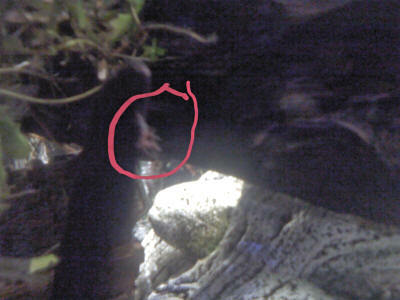 that the glass of the tank and the water creates a magnifying effect and he didn't think she was that big. Anyway, I told him about her eating most daphnia and Cyclops and not paying a whole lot of attention to the bloodworms and how I'd seen her eating bloodworms at the store. He didn't doubt that she ate the bloodworms, but believes it was a struggle for her at such a small size. He suggested I start mashing up the bloodworms for her, which I will do immediately, and then he recommended that I hard boil an egg, and feed her small amounts of the yolk (only the yolk) to help support her at this stage in her life. I wanted to know what you thought about his advice. As we last e-mailed, I have put getting an Elephant Nose aside for now and I'm focusing on my BGK. I feel so privileged to be able to care and enjoy such an exquisite creature that I may be getting a bit neurotic, but I have a concern, so here goes. First of all, I had to take the Tetra dither fish out - they seemed to be bullying her away from the food - so they're back in their old tank. 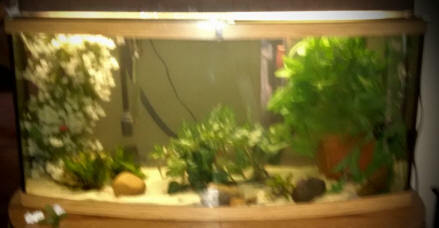 The Brochis are on back-order so now she is sharing her tank with a 2 inch albino bristle nose Pleco - ONLY! They seem to pretty much ignore each other. So, despite the fact that I know my tank was cycled before I got the BGK, I've been doing water tests every few days and the biological filter is working well (never a hint of ammonia or nitrite, and nitrate is staying below 10 ppm as the orange color in the test tube is fairly translucent). The canister filter and powerhead are keeping the tank clean and the water moving. I feed her Cyclops, daphnia, and now BABY brine shrimp, along with some mashed bloodworms. I defrost and rinse these foods and drop them in the tank at the top of both of her fake hanging plants (remember the blurry picture?) 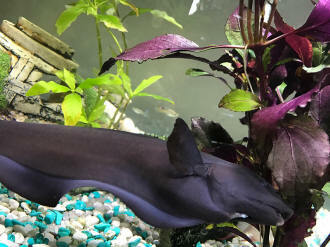 which allows the food to drift down and get caught among the leaves and flowers where she can get to them without the current taking them away to be sucked up by the filter. I feed her three times a day plus once at night just before I turn out the lights. She looks beautiful! The PraziPro did its job well and she has a nice roundness to her body around her pectoral fins. 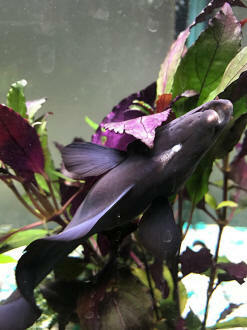 Her color is pristine black and white and her body and fin are perfect. So what's my problem? Well, every article I read about this species, here and around the internet, says they are nocturnal and don't come out at night; that they stay in their glass tubes or caves during the day. But my fish is not doing that. she's not following the script. Do you see anything here that I should be concerned about? fins and the water condition is good. the PH is 7.4 and ammonia, nitrite, and nitrate is all at 0. I had my tank running with some guppies for a month before I got the knife as well. I have no idea what could have killed him. 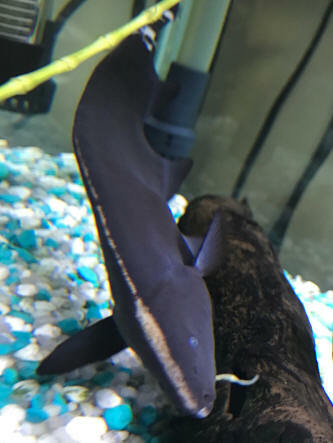 I had a warranty on him so I'm able to get another one but before I do I want to make sure my tank is 100% up to his needs. Many sites I have been searching on aren't giving me straight information. My dad did the NO3 testing with an aquarium chemical test kit and it said it was 0. When I was reading up on ph levels it said 6-8 is good. And I am going to the fish store first thing tomorrow to get the water checked out. Also would German Rams be a good tank mate? <Generally yes; Please see/read on WWM re Microgeophagus... Rams nowayears have a bunch of in-breeding issues. Hi, Need your help.. 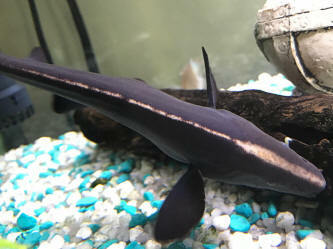 I have order 2 black ghost knife fish, will be receiving them on Thursday!! has white spots!! I want to give them treatment, but I know BKG are very sensitive to treatment!! Will the medicine affect them when they arrive on Thursday?? I really don't want them to die and I don't have another tank to put them in?? 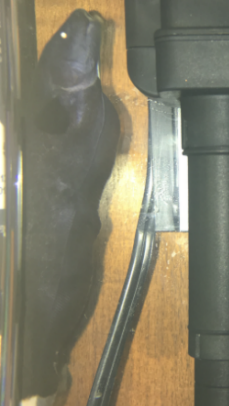 I have a black ghost knife approximate size is 10" who's tail is bent down. Believe to be causes from having too small a cave because of this worry I made a cave much larger for it so the tail would no longer be pressed up against the back. Will it's tail straighten out or is there something making it sick that I can't visibly see and should have some concerns. Please let me know your thoughts and thank you for any help you can provide. <Only time can, will tell here. The usual urging of keeping on top of good water conditions and nutrition. because of this worry I made a cave much larger for it so the tail would no longer be pressed up against the back. Will it's tail straighten out or is there something making it sick that I can't visibly see and should have some concerns. <Will probably not get better, any more than any other skeletal deformity. Hi, I am new to this so please bare with me. thank you in advance. Today I have noticed that he has a huge lump under his neck, not sure if its just one or two, one on either side. From my research I think it might be a goiter. I have no idea how to fix this can you please help me. any advice will be greatly appreciated. <Do purchase and use an iodide-ate ("Iodine") saltwater supplement; and dose as if this were a marine system. Useful for treating goiter.